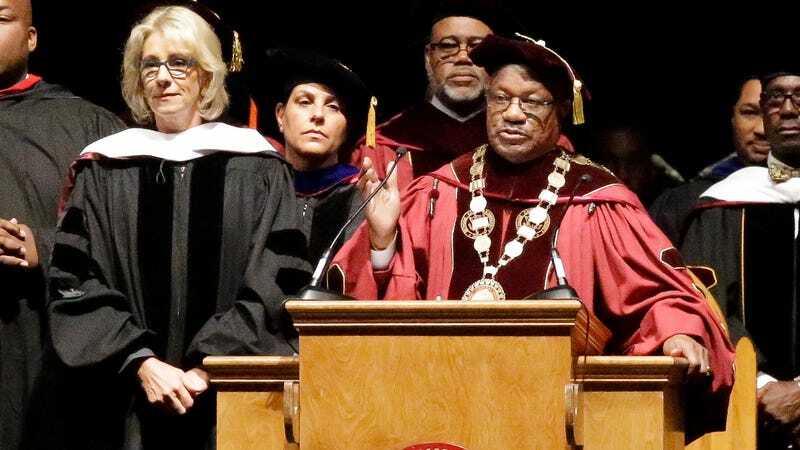 Bethune-Cookman University has announced that President Edison Jackson will resign almost a year before his contract ends. The trustee board of the private HBCU, located in Daytona Beach, Fla., accepted his early retirement but has not announced the terms or specific date of his departure, saying only that it will be announced at a later time, according to the Daytona Beach News-Journal. Bethune-Cookman has been mired in financial troubles under Jackson. The News-Journal previously reported that the school’s tax returns showed an $18 million operating loss from June 2105 to June 2016—nearly 12 times the amount of the previous year. During the same period, salaries jumped $8 million, from $41.5 million to $49.2 million, forcing the school to borrow $7 million from its endowment, nearly 13 percent of the university’s total endowment. Meanwhile, the school is building a dormitory—allegedly from a contract containing Jackson’s forged signature, according to a report by HBCU Digest—that is projected to cost more than $250,000. Bethune-Cookman aggressively financed the 1,200-bed dorm after the school’s credit rating was twice downgraded. By the time it has finished paying for the building, the college will have paid $306 million for a project originally quoted at $72 million. Jackson also faced fire for threatening students at B-CU’s most recent graduation, when they walked out in protest after Betsy DeVos, secretary of education in Donald Trump’s administration, was invited to serve as the commencement speaker. Parents and community leaders have also spoken out against the rising violence at and surrounding the campus after news outlets reported multiple shootings at the school, which has 3,600 students. They account for a third of Daytona Beach&apos;s gun violence victims during the period.